If you have ever gone back to a place where you used to live, especially to a town or city, you will know that it is often very hard at first to find your way about. There may be an apartment block on the corner where you used to play ball in the summer and hockey in the winter, or an office building, all glass and concrete, in place of the little store where you bought your first. ice-cream cone and your first Valentine. Let us pretend that we have Aladdin's lamp, and that by giving it a good rub we can bring back some of the people who knew our part of the prairies a hundred years ago. In the first place, the name Winnipeg will to them mean only the lake; the older ones will say "the Red River Settlement" or maybe just "Red River", which was the fur-trade name, and perhaps some of the young folk might speak of Fort Garry, which was almost chosen as the name of the little village that had grown up along the trail between the Fort and the farms in Kildonan. The usual story about a lost calf is told to explain the crookedness of Main Street, as the trail came to be called, but if you will look at a map of Greater Winnipeg you will see that both Main Street and Portage Avenue were influenced by our crooked rivers, especially if someone can show you where creeks had to be crossed, where the banks were not too steep, or a detour made to avoid a mud-hole. Still holding the lamp carefully let us take our visitors for a drive. It will very difficult for them to believe that under the pavement on Portage Avenue lies the old trail that did not stop at Portage la Prairie but went all the way to Edmonton. Banks and stores and office buildings, hotels and schools and churches will puzzle them too, and used-car lots. But when you have gone about three miles west from Main Street, and are all ready to point out the new overpass and the Shopping Centre and the Auditorium, one man may suddenly say, "But surely that is Catfish Creek  and St. James Church beyond." Before you can answer the small boy in the front seat pipes up, "I came here when the church was first opened, we drove in an ox-cart from the Fort. And another Sunday the Bishop was there, we had our supper on the grass, and he gave us some sweets." Or very quietly a young man who looks as if he would be more at home on a horse than in a station wagon, may say; "You'll not be needing the ford, then, when you go to the plains? Yon's a fine bridge downstream where the water runs deep again." We should all like to own Aladdin's lamp, but we do not need it to see one small part of Winnipeg very much as our grandparents and great-grandparents saw it. The creek is still there, though we now call it Omand's Creek. The river is there, wider and shallower than it was, but still LaVerendrye's Assiniboine and, rather hard to believe, the Assiniboine on which in the 80's steamboats went all the way to Fort Ellice, close to the present Manitoba-Saskatchewan boundary. And the ford is still there, though only a few people would now be able to find it, perhaps only someone who can remember watching a man with horse and wagon as he drove down the bank on the south side of the river, into the deeper channel, the horse feeling its way carefully through the swift current, then shaking off the water like a dog as it reached dry land on the north bank and turned into the lane at the foot of the cemetery; all that is now left of the ford road. And St. James Church is still there. As you probably know, our earliest settlement was along the Red River. However, by the 1830s and 1840s a new generation had to look for homes and some of them chose to move across to the Assiniboine. There were a few families from Kildonan, more from the fur-trade, and in 1848 a number of British army pensioners were brought out for garrison and police duty at Fort Garry and given grants of land along the Assiniboine west of the Fort. There was neither church nor school nearer than St. Johns, so it was not very long until the people of the new settlement decided that they must have both, and it was then that the parish of St. James was formed. The site chosen for church, school and rectory was close to the centre of the parish east and west. Old-timers used to talk about "the high land up the Assiniboine" ; it was really not very high except to people who lived on the prairie, but the angle formed by the creek and the river had always been a favorite camping ground for the Indians, who said that the ridge, running west for a mile or more, had never been under water, not even in the worst flood of all before the white man came. The settlers knew that it had been dry in 1826, and they soon found that it remained dry in 1852. We know that it was still safe in 1950, nor did Omand's Creek overflow then, though it did force jets of water like fountains through the pavement under the subway, while in other parts of the city, far from the rivers, water seeped into basements, having found its way through old creek beds that had long been filled and built over. The rectory was finished first. It was a sturdy building of squared oak logs, rather like the Ross House, and it stood until 1909 though by that time it had not been lived in for many years. In the spring of 1852 the flood came and as many women and children as the rectory would hold were packed into it while other families camped on the ridge nearby. It was from this camp that three St. James men loaded supplies into a dugout and paddled across the flooded prairie to Stony Mountain where settlers from Kildonan had taken refuge. Timbers had been cut for the church too but they had been carried away in the high water, so again the men of the parish went west to Baie St. Paul on the Assiniboine, cut new logs, and floated them in great booms down the river to the site where they were trimmed and laid. An old story that shows the crookedness of the Assiniboine is that on one point the men used to camp two nights beside the same fire, with a hard days' work between as they brought the boom around the bend. The church is of the same construction as was the rectory, but it is boarded on the outside so that you cannot see its bones. The bones are there, however, held together with square, hand-made nails, and if you look closely you will see that the framing on doors and windows is also hand work. Finally the school was built, close to church and rectory. 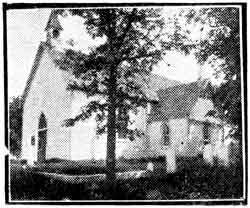 Until Manitoba became a province there were no public schools, only church schools, and when finally school districts were set up the Parish gave the lot where "The Paddock" now stands for a public school, and the little brick building was put up that many people believe wrongly to be the first school. All that St. James Parish now owns of the large grant which was given to them by the Hudson's Bay Company is the churchyard, one city block, Doreen and Tylehurst Streets east and west, Portage Avenue and the river north and south. The oldest graves are nearest the church, and on the worn stones you can make out names that were well known in their day. Not far from the north-east corner of the church there is the grave of a man who fought in the Peninsular War and at the Battle of Waterloo. He was James Armstrong, a pensioner, and, you've guessed it, he lived in Armstrong's Point. Perhaps some of you have gone to the Isbister School, or even won an Isbister Scholarship  all the Isbisters whose names you see here were related to the man who left money for the education of the children of his native land, though he himself died far off in England. There are Bourkes too, children and grandchildren of the man who at Seven Oaks held off the war-party with the Colony's one cannon until some settlers caught out in the fields could reach the Fort. It was only a very small field gun, pulled by two men, but the half-wild Indian ponies would not face it. There are Bruces and Fidlers, Elses, Ramsays, Smiths, Hal-lets, Cooks, Taits. Perhaps you read "Looking Backwards" in the Free Press and will remember the name of "Robbie" Tait, who lived just west of where the footbridge crosses to Assiniboine Park. He was a very busy man, with a mill and a ferry, and he had the first harvesting machinery that was brought into the country. If Aladdin's lamp could bring back some of these older men they would have stories for every stone, and, too, for the sunken and unmarked plots. One must walk with special reverence in the older part of the cemetery, for we cannot always know what lies beneath our feet. You, however, would need to explain the stones that name young airmen killed in training here during the Second World War. James Armstrong and Sergeant Rickards of the Royal Marines would have found plenty to talk about with these lads. The spring is a good time to visit the old church, before the leaves are so thick on the trees that they almost hide it as you approach. ("The maples were planted," an old, old man told us, "but the oaks were always there.") From the overpass you can see clearly how the land lies, and if your imagination is working well you can perhaps wipe out all that is new, seeing only the creek and the river and the little white church. Best of all, you may find yourself face to face with History, and if that happens you will never need Aladdin's lamp again.